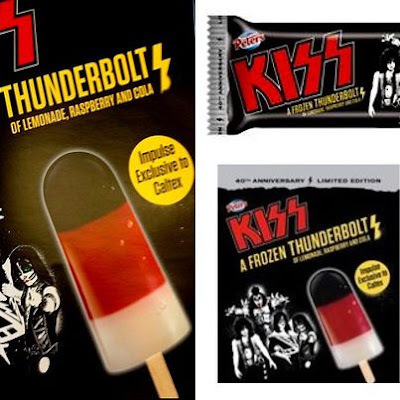 KISS have teamed up with Australian ice cream brand, Peters, to bring back the famous Peters KISS ‘Thunderbolt’ Ice Block. This month, Peters will re-launch their widely popular 1980s KISS ‘Thunderbolt’ ice block to coincide with KISS’s Monster Tour in Australia celebrating their 40th Anniversary. “I still have 12 original boxes of the ice blocks from the 1980s," adds Gene Simmons. The Peters KISS ‘Thunderbolt’ ice block will be issued in three flavors – lemonade, raspberry and cola. The Peters KISS ‘Thunderbolt’ ice block will be available exclusively in Caltex outlets from Wednesday, February 6, and Coles supermarkets from Wednesday, February 13 until sold out. The KISS/Motley Crue/Thin Lizzy tour kicks off February 28 in Perth.